With Easter coming up, and with some vague sensation of Spring flitting in and out, teasingly, I have lilies on my mind. And so I thought I’d pass on a free hand hand embroidery pattern featuring the lily. This is my variation of a design from a very old folio of ecclesiastical embroidery drawings that I was able to purchase last year from a European rare books source. I’ll tell you more about the folio later – it’s an amazing collection of designs, all full-sized, from the first decade of the 1900’s. My variation of the lily design can definitely be used for secular embroidery. I picture it as a goldwork piece with a touch of silk here and there, but that’s just me. Funny…I have a hard time saying “goldwork” today, after the whole framing situation with the Mission Rose that we talked about yesterday. Just to follow up briefly on that topic – and thank you so much for your input! – I didn’t like it any better this morning! I’m sure you’ll see another update down the road, when I make some changes. But, back to the lily. Whitework, goldwork (I said it again…), crewel work – you could approach it with pretty much any surface embroidery technique. Does it beckon for any particular technique in your mind? The diamond frame would be a nice spot for further line embellishment, too. I might play with that. I like the flowy leaves – I see them split with two types of goldwork, at least half of each leaf couched with green silk, and the whole piece worked on a colored background, or at least, not a white background, so that the lily can take center stage in shades of white silk, or in gold couched with shades of white (Or Nué-style). Maybe a good project for trying one of these ground fabrics for embroidery that we discussed last week? In any case, if you decide to do something with it, I hope you enjoy it! Tomorrow, a Secret Garden update with lots of pictures! Later in the week, I’ll be showing you some beautifully worked embroidery from a reader, and of course, we’ll fill up the week together with more of the typical tips and tidbits. If you’re looking for free hand embroidery designs for your own use, you’ll find plenty of them on the Embroidery Patterns page here on Needle ‘n Thread. There’s some fun Springy stuff in there, like this little egg full of flowers, this spring garden corner, these William Morris tulips – if you’re looking for something new to stitch up! I don’t tell you often enough,how much I appreciate your blog and all the beautiful patterns. I pour my coffee, sit and have a good read. I dream and make plans. What usually happens,I make a note and come back. Print off a pattern, get my floss, fabric, etc. and life happens. However, when I get the chance, I do get to work and love every second. You make my day with your generosity. another quick note about yesterday and the frame- obviously the frame was too heavy-I’m not sure what I would suggest, but my advice-as per usual comes from the theatre-which is my field-it’s about focus-the current frame steals the focus from the embroidery-with the amount of work put into that piece of embroidery, I would posit that you’d like the embroidery to be the focal point-whatever mat or frame you select should support the focal point not compete with it. Thank you Mary this is lovely ! 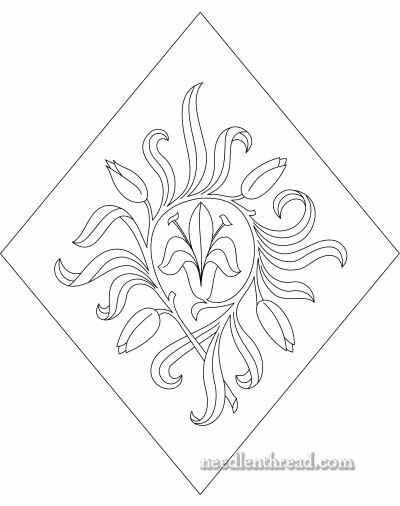 A lovely lily diamond design, a lot of thoughts are going through my head on how to approach this pattern so many options on how to embroider this piece, white or yellow for the lily and different shades of green for the leaves all embroidered in silk thread lovely. A great Spring design really cheerful. Thanks for sharing this with us. Thanks for the pattern, Mary! Thank you for the beautiful pattern! I am humbled by your generosity and willingness to share and teach. I start my day by reading your blog, and it makes it a good day! I continue to hunt and search and seek after patterns. This is very lovely. I am enjoying this very much. Now I am learning embroidery with different ways.I am very thankful for this.